A woman whose father was among three neighbours killed in an IRA bomb has failed in a bid to overturn the refusal to order a new inquest. Dorothy Johnstone wanted a judge to quash the decision by the attorney general not to order a fresh tribunal into the 1988 bombing in Londonderry. Her father Eugene Dalton, 54, and Shiela Lewis, 68, were killed in the explosion. Gerard Curran, 57, died months after being pulled from the rubble. The attack became known as the "Good Samaritan bomb" because the three friends had gone to check on the whereabouts of a neighbour in Derry who had been kidnapped earlier by the IRA. The IRA later apologised, admitting it planted the booby-trap device in a bid to kill soldiers. At the High Court on Tuesday, a judge ruled that Attorney General John Larkin was justified in concluding that a new inquest was not advisable. The judge cited the financial and human costs of a further public hearing and said that it would be unlikely to lead to the prosecution of the perpetrators. Ms Johnstone's solicitor said the family was "disappointed" with the decision and will appeal. The case, which challenged the decision-making powers of Northern Ireland's chief legal officer, was the first of its kind. 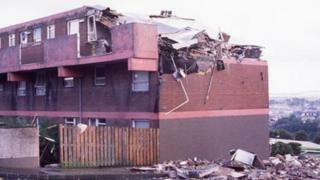 In July 2013, Police Ombudsman Dr Michael Maguire published findings that officers had information about an IRA booby-trap bomb in a house in the Creggan estate, but did nothing to warn residents of the possible danger. He identified a failure in the police obligation to protect the lives of the public. Following the report, the attorney general decided a new inquest was not advisable at the time. However, Ms Johnstone's legal team claimed it could help establish responsibility for police failures. They argued that investigative obligations under the European Conventions of Human Rights were rekindled by the Ombudsman's findings and that ordering a new inquest could provide fresh hope of identifying and punishing those responsible. The court also heard that since Mr Larkin had come into office he had directed new inquests into at least 30 cases involving more than 70 deaths - many of them Troubles-related. However, the judge backed the attorney general's decision. He said there was no evidence of police collusion in the bombing. "It is very difficult to see how any practical benefit could now be obtained for the public in going over the procedures then being followed by police officers in Derry at the time, when they say that much of the city was out of bounds to them by terrorist activity." He added that to ask civilian and retired police witnesses to give evidence in a public inquest "will inevitably be unwelcome and positively distressing" and that "many may have legitimate health grounds for refusing to attend". "I am very pessimistic that an inquest at this time would succeed in securing any significant accession of information compared to that which the Ombudsman obtained." In a statement, Ms Johnstone's solicitor said the family of Eugene Dalton was "disappointed with the judgement". "We welcome the level of scrutiny which the court engaged with examining the process of decision making by the attorney general, whose office has a number of similar applications before it. "We are, however, disappointed in the extent of the court's focus on perpetrators, and that the same focus was not applied to the to the role of the police when, as in this case, police involvement and knowledge raise grave concerns."